Sign Art provides full service custom sign, graphics and marketing solutions to central Indiana businesses and organizations. And we are leading internet provider for a number of items such as step and repeat backdrops, retractable banner stands, big checks and vinyl banners. Our 12,000 square-ft shop and showroom is located at 181 Sagamore Parkway South - Suite B, Lafayette Indiana. Sign Art started and was in the same location for 13 years....expanding several times. We moved to our new, state of the art, location in late 2015. Our virtual showroom is right here at www.signartetc.com. Sign Art Etc is built on Teamwork.....Creativity......Reliability. Every Time. Our clients tell us they really like our team approach, our creative solutions and our ability to complete their project on time and within budget. They've said we are the best team in the business. Period. 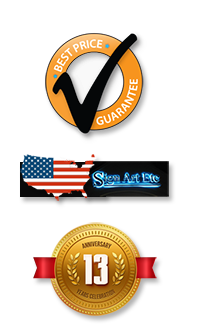 In many instances, our clients have been disappointed with other sign and step and repeat suppliers. They found the end result wasn't what they expected in terms of quality or delivery or that the entire experience was not handled in a professional manner. The only surprise with Sign Art Etc is how easy it is to work with our team. Making you successful isn't just an interest; it's a passion....we take great pride in our creative sign solutions. Check out the rest of our website for examples of our services; then contact us for more information on your specific needs. The Sign Art team looks forward to discussing your next project. Or call us toll free at 1-800-799-7436.